Review date: 19th November 2006. 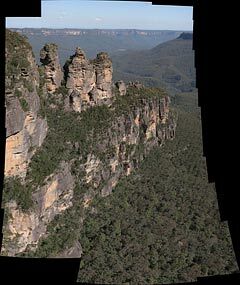 If you'd like to try stitching pictures together into a panorama on a Windows PC, your first stop should be Autostitch. Autostitch creates 2D panoramas - stitching images top to bottom as well as side to side - though it can't do 360 degree images. It can produce very impressive results, it's fairly easy to use (especially if you actually read the readme file...), and it's free. 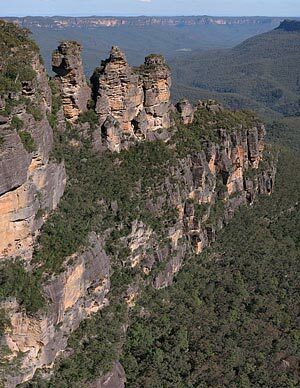 At first glance, this is just yet another bloody picture of the Three Sisters from Echo Point. And it pretty much is. Which is a success in itself, given the weird-blurry-bits and strange distortions that old-style panorama software creates. There are a couple of fuzzy bits in the trees, but the stitch job really is close to perfect. This picture's main claim to fame is that it's bigger than most. The full sized version's 6065 by 7853 pixels, 5.8 times the pixel count of my EOS-20D, and significantly higher than the resolution of the 39 megapixel sensor used in the Hasselblad/Phase One medium format backs, which makes them the highest resolution non-scanning-back commercially sold digital cameras in existence today (they're yours for around the $US32,000 mark. From a discount place, anyway). Anyway, even saved at only Photoshop's JPEG quality level 8, this image is 10.4 megabytes. UPDATE: I've uploaded an even larger version of this image to Flickr now. If you click the "Original" link on this page, you'll get a 15-megabyte version. The original panorama looked like this, before I cropped off the jagged edges. It was 7909 by 9397 pixels. And this was only my second attempt - if I'd been more careful with my photographing, taking pictures with a wider angle lens, I could have easily covered three or four times this field of view. Autostitch genuinely is pretty much automatic as far as the actual stitching goes. But its memory management is not fully cooked. Different people have different hints about how to avoid "out of memory" errors, which are perfectly happy to crop up when there's lots of physical memory and disk space free. Autostitch Just Doesn't Work for really big panoramas (no, not nearly this big), but it won't just tell you that at the outset. Instead, it chews away for a while (like, half an hour, even on a cutting-edge PC), then gives you a memory error when there's obviously still tons of memory left. Then it gets wedged so you have to restart it and re-enter your options changes, because it doesn't save them. Autostitch also only accepts JPEG input (which means 8 bits per channel - it's technically possible to make a 16-bit-per-channel JPEG, but most software doesn't want to know about them), and it only gives you JPEG output. You can wind the quality way up if you like, though, for results that're as good as lossless for all practical purposes. And Autostitch is, I remind you, free. And it really does work rather well. My best hint: If you've taken 80 eight megapixel pictures, you will not be able to make them into a 100%-zoom panorama with the current version of Autostitch. You will, probably, be able to make them into a smaller one - 60% scaled, or something. To save loading and processing time, try pre-scaling the images and making a 100%-zoom panorama out of those smaller versions. Panorama software, no matter how fancy, is physically incapable of completely eliminating the geometry errors you get from shooting a bunch of pictures of nearby objects with a hand-held camera. Ideally, panorama shots should all be taken from a zero-dimensional camera floating in Physics Experiment Land; in the real world, the best option is a tripod, and a camera with a well-placed tripod socket, so it pretty much rotates around its entrance pupil. If you just hand-hold the camera, turn and shoot, the perspective will change from shot to shot and there will be things that can't be lined up by anything short of actual retouching. For landscapes with nothing in the foreground this doesn't matter, since the perspective errors will be much smaller than a pixel, but for indoor panoramas it's important. Autostitch can still produce a pretty decent result, though. Click the above picture and you'll get a (merely) 362 kilobyte 4418 by 1196 file, which is a 50% scaled version of what Autostitch made out of 19 quick indoor snapshots. There are some obvious spots of dreaminess in there where stuff didn't line up, but it's really not that bad. I rejected another attempt at the same scene because Joey (he's the one on the right; though he is similar looking, Joey is not Mickey) moved between shots. This time, though, he was completely mesmerised by the idea that a delicious bird shadow might appear on the curtain at some point. There are lots of panorama software options these days, but if not for its memory problems, Autostitch would be right up there with some rather expensive professional packages. With a list price of $0, it's a standout. My blog post about this article. It may or may not have many fascinating comments.